As rain seemingly followed Class A Advanced Charlotte over the last week or so, Brendan McKay didn't pick up a bat for about six days. So when he stepped into the box to take some pregame hacks Friday, he admitted to hitting coach Joe Szekely that he felt rusty. By game time, McKay was more than ready and produced one of his finest efforts. The third-ranked Rays prospect recorded his first career multi-homer game, driving in four runs to power Class A Advanced Charlotte to a 6-0 win over St. Lucie at First Data Field. "It was really not thinking about a whole lot," McKay said. "It had been six days since I last swung a bat, so I was just out there trying to get a feel for it again and let the bat work for me and not do too much." On Thursday, McKay took the rubber for the first time since June 11 after oblique tightness kept him sidelined for nearly a month. In his return, he tossed three scoreless innings with five strikeouts against the Mets. On the offensive side, McKay was 1-for-8 since coming off the disabled list but had not gotten an at-bat since July 19. 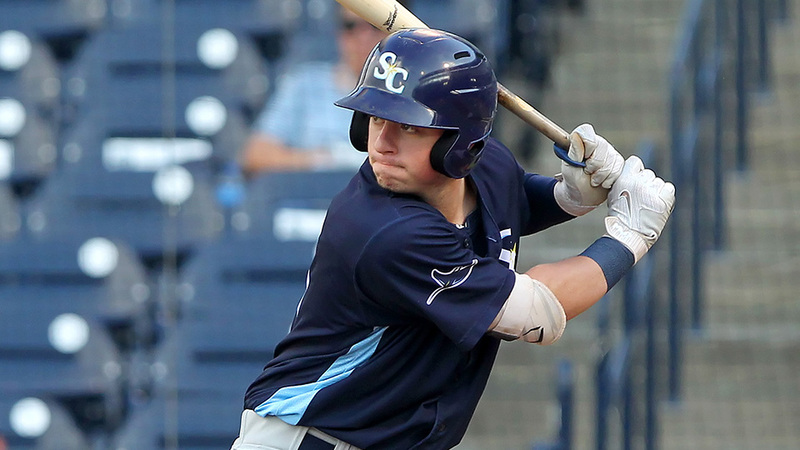 During the past week, the plan was to get McKay some swings -- at least during warmups -- but the Stone Crabs faced five cancellations in as many days. Even without consistent time in the cage, McKay produced his ninth multi-hit game of the season. Szekely said the University of Louisville product was no worse for wear after the long layoff. McKay's timing was nearly perfect against left-handed starter Blake Taylor, which the hitting coach sees as a positive sign. "He goes up and has a couple of home runs and I said, 'Well, I guess when you don't have expectations, there's no pressure,' and he started laughing," Szekely said. "It shows what kind of ballplayer he is and what kind of hitter he is. Hitting's funny -- you can be locked in for so long and then you come out and felt like you've never swung the bat before. It's kind of funny how that goes. He looked really good today and everything was simple. ... I told him, 'BP is overrated, isn't it?'" Taking his turn with the stick Friday, MLB.com's No. 30 overall prospect grounded out to shortstop in the first inning. But after a leadoff single from Jermaine Palacios in the third, McKay stepped in with a chance to do some damage. The 22-year-old worked the count to 2-0 after seeing a couple of pitches up in the zone, then blasted a mistake from Taylor over the right field wall for a two-run dinger. McKay said it was important in that at-bat to stay patient and not get too jumpy in the batter's box. Keeping that approach in mind paid off in a big way. "Obviously, when you're in a count with an advantage like that, you're not necessarily trying to hit a home run but just get something you can get a good swing on," McKay said. "It's trying to put something in the gap and start a good inning for your team." An inning later, Palacios worked a one-out walk to again set the stage for McKay. Facing the southpaw for the third time, McKay had some familiarity with Taylor's stuff and, much like his previous at-bat, crushed the third pitch over the right-center field fence for another roundtripper. McKay said he can use his own pitching mentality to his advantage when he's at the dish, in the sense that he's able to understand what pitchers might throw him in specific counts. Although he prefers not to overthink a pitching staff's strategy against him, he said it might give him a slight edge against someone he's seen multiple times in a game. "You've seen a pitcher a couple of times and you've seen most of his pitches," McKay said. "And you have an idea of what he wants to do from a pitching standpoint. You just try to get into a good count and react to anything he throws. It's just staying simple and doing the work with the barrel." McKay flied to left in the sixth but walked in the eighth as he reached base three times for the first time since June 3 when he was 2-for-3 with three walks. With Friday's homers, the Pennsylvania native sports a .210 average and .741 OPS through 17 games since a promotion to the Florida State League on May 14. Between his time with Charlotte and Class A Bowling Green, he's hitting .215 with a .395 OBP, four homers and 32 RBIs. On the hill, he's 4-2 record with a 2.53 ERA and 0.70 WHIP over 57 innings across both levels. McKay said he's gotten comfortable in his routine as a professional, keeping his pitching days and ones as a hitter on a pretty tight schedule. He's generally slated to pitch every six or seven days and mixes in around four games in the field before the next outing. Although Szekely said that while McKay might not get the same number of reps that a regular position player does, he's put in meaningful prep work. "We're trying to keep him on the same schedule he had in college, but the only difference is we're playing seven days a week and not three or four days a week," the hitting coach said. "Things are a little different and you have the travel. But it's about quality over quantity in everything on both sides. He does a good job of that and a good job of monitoring himself. He doesn't take too many swings and he comes in and has got a plan. He knows what he has to do and does it and he looked pretty good tonight." Jake Fraley contributed his first homer of the season and drove in two runs for the Stone Crabs. Blake Bivens (6-4) tossed seven scoreless innings, allowing three hits and a walk with five strikeouts to halt a personal three-game losing streak.